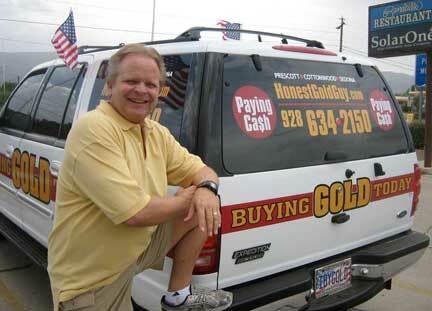 Are you searching for a mobile gold buyer in the Prescott area? Have you ever wondered if there was a gold buyer that makes house calls? Prescott Gold and Silver does at home gold buying for those with special circumstances. Perhaps you are in a situation where you just can’t get away to make it into my office. Perhaps you just don’t want to be pressured by a fast talking, scam gold buyer. I often come to homes fro appraisals of estates of gold jewelry, coins, and coin collections. I will schedule an at home appointment provided you have enough gold to make it worth my while. If all you have are a couple rings and a small chain, I may not be able to make a home appointment with you. If that’s the case schedule an appointment at my office in Prescott. To explore the possibility of a home appointment just call me. Our house call will go like this: At the time of your appointment, I will arrive with all my testing supplies, tools, a certified gold scale, and my price sheet based on that days spot price. I’ll sit down and go through your items one by one as you watch me evaluate, test, and weigh your gold, silver, or platinum. I’ll price out you items and add them up. If you like the numbers, I will write you a check, and add you to the hundreds of my satisfied customers. If you need to sell gold jewelry, silver, platinum, coins, or any precious metals, you can set an appointment to meet me at my Gurley street location, or if you need me to meet you at your home call Greg today at 928-710-2137. I’ll meet with you on your schedule.